There are many file conversion programs on the market, and the features and functionality of those programs can greatly vary. So if you have a regular need for document conversion at the office, it can be difficult to know which level of product might be right for you. Individuals at home for personal or business uses. Individuals at the office for one-off, batch, or automated documents conversions. Enterprise solutions for IT & end users with workflow integration. In this post, we’ll take a look at why professional file converter software makes sense for business users. In general, businesses often require a higher level of security, reliability, professionalism, consistency and flexibility from their file conversions than what personal, “one-off” users might require. With that in mind, here are some of the big reasons why it makes sense, even for very small businesses, to invest in proper enterprise-level conversion solutions. If your business operations call for regular file conversions, your employees may take it upon themselves to download some piece of untrusted software on their computer. That’s not a comforting thought, particularly if your documents contain important information that could be compromised. With trusted software like the products provided by Peernet, there’s no worry about the types of programs that you or your staff are downloading. Our software is highly secure, and trusted by clients around the world – including large multinational organizations. There’s also the potential concern of, once you upload your files for conversion, where do they go? Again, many businesses have sensitive customer data on file, and this information should not be trusted to anything less than a highly secure conversion system. And when you’re using a Peernet file conversion product, there’s no worry of downtime, incomplete conversions, or server time-outs. Our software is rigorously tested, designed with reliability in mind. You can have confidence that the conversions are getting done, and done correctly. A free online file converter has its uses, but is not always appropriate for a professional business to be using. For one thing, free file converters often stamp a wordmark on your converted documents. That’s not ideal for an organization trying to establish a professional identity with their clients. Another drawback of online file converters is that you may be limited in your conversion options. Finally, online file converters are not built for a high volume of conversions, and not built with speed in mind. Peernet products give you the control you need to easily output professional document conversions, every time. And software like our Document Conversion Service are purpose-built to handle high-volume document conversion. Files are outputted at a similar size, so you can accurately forecast your file storage needs. A collection of output settings that works well for one organization may not be right at all for another one. That’s why it’s important to have control over the output settings of your document and file conversions. Our top-level suite, Document Conversion Service, even has the ability to add additional image conversions beyond what’s included out-of-the-box. Along the same lines, some businesses have document conversion needs that are somewhat specific to their industry. As an example, one of our clients recently expressed a need to convert wide-format text documents, which was no problem. Peernet takes all our client’s requests into account and sometimes even programs new features specifically to fit the custom needs of our varied client base. Even though some of our software is designed with business users in mind, that doesn’t mean that it’s difficult to use. We’re dedicated to creating software that carries out complex conversions, while remaining easy-to-use for the everyday user. 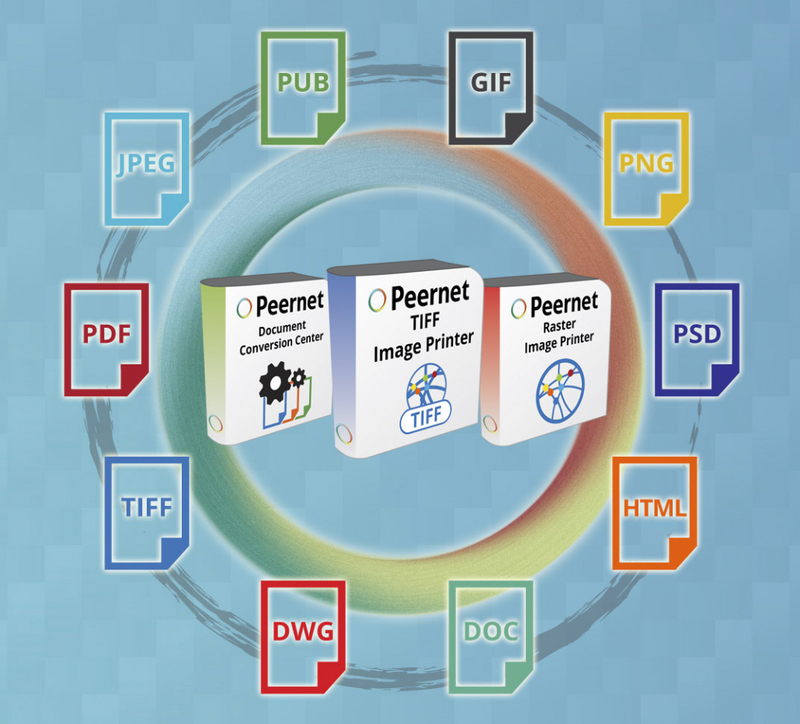 Our line of Virtual Image Printers makes it so easy to create PDF, TIFF, JPEG and more. In simple terms, the image printer is installed, where it then can be accessed in the exact same manner as any ordinary, physical printer. So if you or your staff members can print a document, you can use our virtual printers to create image files. As well, all of our products run on Windows, so there’s instant familiarity with the software’s menus and navigation for the vast majority of users. Experience the difference that professional file conversion software makes. Don’t trust your company’s important file conversions to untrusted software, or an overseas website. No matter the size of your company or the industry that you’re in, Peernet has a file converter that’s right for your business. If you’re not sure which piece of software you need, view our conversion software page to get started! Or contact us any time so we can help you discover which product is perfect for your needs.